The following article was originally published in Gallop magazine in December 2010. Like most horse lovers, Anna Saillet has seen her share of equine problems. However, during her two years of volunteer work for the Gambia Horse and Donkey Trust in Africa, she has seen sights that most of us can only imagine. “We also routinely saw leg and harness wounds and lameness caused by lack of knowledge on the owners’ part. Parasites, infection and disease are also rife,” explained Anna, at a recent talk to the Cheshire HCM group in North Wales. Anna studied Animal Care and has a degree in Animal Behaviour. Her love affair with The Gambia started after spotting an advert in Horse and Hound asking for volunteers to work with horses in Africa with charity The Gambia Horse and Donkey Trust. “After a telephone call with the charity that lasted 40 minutes, I realised that this was something I had to do,” she explained. The Gambia was a culture shock for Anna. One of the smallest countries in mainland Africa, it’s a long, narrow strip of land almost completely surrounded by neighbouring Senegal. Only 30 miles wide at its widest point, it has a population of just 1.7 million and is one of the poorest African countries. The main source of income is farming, mainly peanuts, and there is little export trade. Its rainy season and extreme heat make it ideal mosquito country, and malaria was commonplace for Anna and her co-workers. The Gambia river runs through the middle of the country, and most of the infrastructure consists of dirt tracks except for two main roads bordering the river. A third of the population of the country are below the poverty line. There are a huge variety of ethnic groups, each with their own language and traditions, but the population is tolerant and well-integrated. The official language is English, but many people speak only their own language. The main religion is Muslim, but Christian groups also exist. The Trust is based in a village called Sambel Kunda, in the Central River Region. This small village, mostly populated by the Fula tribe, is at least six hours drive from the capital of Banjul, and consists of mud huts and family compounds. The huts have no electricity, and often no candles either. With candles costing about two dalasi (approximately four pence) each, an average family cannot afford to burn their money, when the typical wage is about £20 per family a month. Local water is either from wells, which are sometimes contaminated, or hand pumps, and the staple diet is rice with peanut sauce. Horses are not indigenous to the Gambia, and in fact have only been in common usage for about 30 years, having been imported from neighbouring Senegal. This unfortunately means that horses are not well adapted to the local climate and parasites, and also that there is no tradition of horse management amongst the local population. Previously to the arrival of horses, oxen were used for transport and farming, but were too slow to be efficient. Donkeys are more suited to the environment and more resistant to disease, but slower than horses. However, equine life in The Gambia is hard even for a healthy horse. Malnutrition is an issue, as the staple equine diet in the Gambia is groundnut hay, made from the leaves of the peanut plant. ‘A bale of groundnut hay can cost as much as a bale of hay in the UK, and farmers who don’t grow it themselves simply can’t afford to feed sufficient quantities,’ explained Anna. 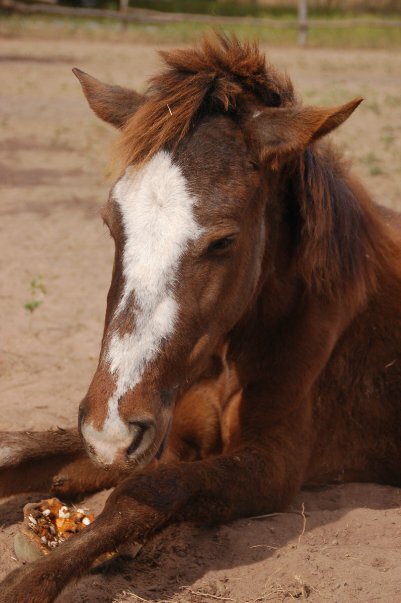 Another common feedstuff is millet, which is indigestible when raw and is a major cause of colic. Cases of tryp anosomiasis (African Sleeping Sickness) are common. The disease causes weight loss and lethargy, but is normally curable once diagnosed by a blood test. Harness galls from poorly fitting and incorrect harness are something the Trust sees on a regular basis, as are scarred and disfigured tongues from the barbaric Senegalese bits in common usage. These bits have a heavy iron ring used as a curb chain, and can gradually cut off circulation to the tongue, causing damage to the tissue. Equally common is the practice of using just a knotted rope as a bit, meaning that almost 75% of the horses seen by the Trust have tongue abrasions. The Trust is gradually working to replace this horrific equipment with snaffle bits and headcollars donated in the UK. Even well-meaning actions can have dreadful consequences, as owners often light fires near their horses to keep tsetse flies and other biting pests away. Anna has seen horses with terrible injuries caused by fire, including Molly, an orphan foal burned by such a fire. Although suffering extensive burns to her head and neck, Molly has made a full recovery at the Centre. An important part of the Trust’s work is their education programme. They teach Grades 5 – 7 in 10 local schools, teaching animal management with the use of interactive lessons that frequently saw Anna dressing as a donkey! Education – The Trust are currently undertaking a programme of courses and education in 10 local schools. Holding the Annual Horse and Donkey Show. This event – originally set up to showcase proper welfare and management – has become immensely popular. It is now shown on national Gambian TV, and people walk for up to three days to compete. Castration of stallions. Most of the local horses are not castrated, and the Trust will carry out this procedure if necessary. The Trust is always grateful for donations of equipment, including bits, headcollars, bridles, numnahs and girths. These are most useful in pony sizes, but any equipment can be used whatever its condition, as the Trust has a team of harness makers who are able to make alterations and repairs. Veterinary equipment, particularly bandages, is also welcomed, as are any left-over tubs of feed supplements. 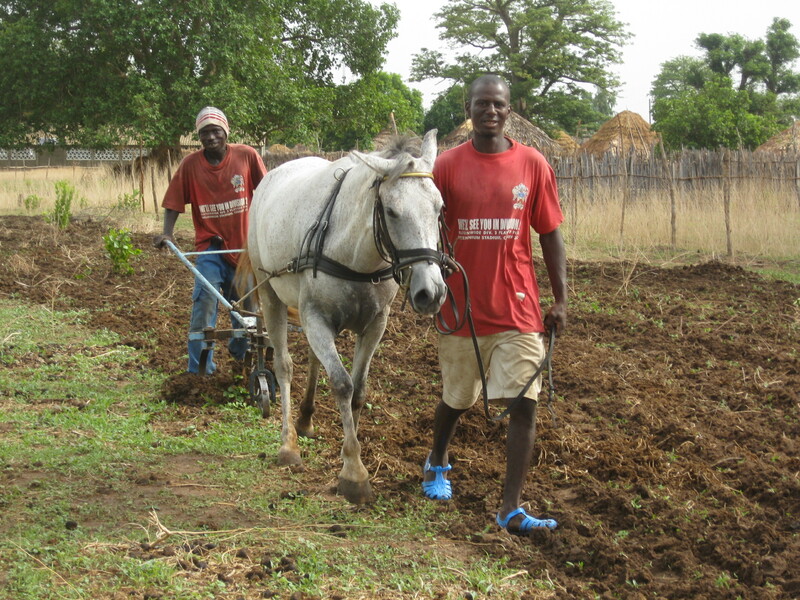 If you are based in Cheshire or North Wales and have some equipment you would like to donate, please visit the Trust at www.gambiahorseanddonkey.org.uk to arrange a pickup. Alternatively, you can help by making a donation, setting up a standing order or holding a fundraising event.